Like I needed one more decadent treat to have on my list of favorite vices…. But I found one anyway. 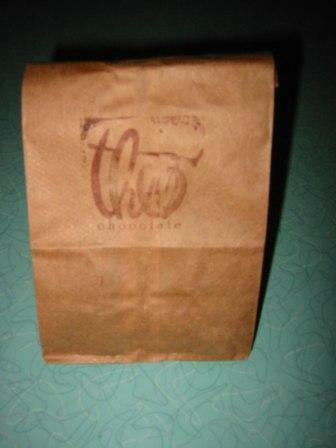 I had an errand to do at Theo Chocolates in Fremont yesterday (honest, I really did). While there, couldn’t help reliving a couple of my favorite bites from a previous trip. I’d picked out my PB&J, gianduja, cardamom caramel and lavender-jalapeno caramel to take home in a plain little brown paper bag. Just about to pay and my eye spies two boxes of treats I hadn’t seen before: Big Daddy confections that were introduced during the holiday 2008 season. The marshmallow version features a square of the white fluffy confection atop a layer of homemade graham cracker crust and rich caramel, the trio coated in both dark and milk chocolates. I’m not a big marshmallow fan, so I opted for the peanut butter version, with peanut butter praline where the marshmallow would be. There are three individual (generous) pieces in each package. Not individually sealed, however, so there’s a distinct risk that you might be compelled to eat more than one. Try to have friends around when you open the box, to avoid that temptation. I managed to stop at two. Just barely. Oh, and for your earth-loving peace of mind, know that these Big Daddies are among the organic confections made by Theo. And Fair Trade as well. The Big Daddy items are not in wide distribution right now, available only at their Fremont shop-and-chocolate-factory and online. Worth a visit, either way. What a delicious indulgence. Such an unassuming little bag. I’d be surprised if any food-conscious Seattleite hasn’t yet heard of Theo Chocolates, as have surely many non-locals as well. They’re deliciously ensconced in the former Red Hood Brewery space in Fremont, making not only top-quality chocolate, but doing so by custom roasting their own beans purchased from only organic, fair trade growers. Restaurant menus, retail shelves, special events…Theo chocolates are showing up everywhere. Tom Douglas invited me to sit in on a day of this year’s Summer Camp week yesterday and they had a tasting of the chocolates late afternoon, just one other example. So when we were strolling around Fremont Sunday and noticed the shop open, in we went. Their 3400 Phinney chocolate bars are fun and popular, premium chocolate studded with very interesting combos: coconut and curry (subtle and delicious), chai, cocoa nib brittle and hazelnut crunch (which has a pinch of salt in it) among them. But I veered right over to the pretty display case with their elegant chocolate confections instead. I’d been at the Fred Hutchinson Premier Chefs dinner gala in May and each place setting had a little brown box with two Theo chocolates in it. I nearly fainted with delight when I found that one of the chocolate centers was peanut butter and jelly. I hit the jackpot because the other chocolate was pure peanut butter with a delightful surprise of crispy crunch. 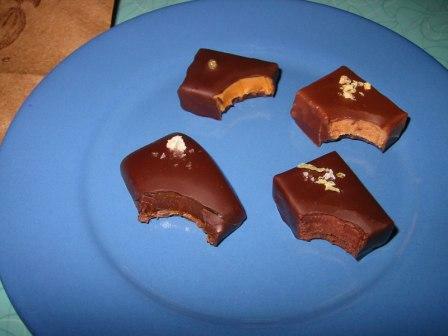 For my treat later Sunday night I chose (clockwise starting from 11:00): burnt cream (silky creamy texture with hint of crème brûlée flavor), that decadent peanut butter version again, orange-thyme caramel and for the life of me I can’t remember what flavoring that last ganache-type chocolate had! All super delicious. And I couldn’t eat just one. Which is why I had trouble sleeping soundly that night!